The church of Santa Croce in Florence is most known for the famous Italians buried there (which is why it is referred to as the church of 'Italian Glories'). 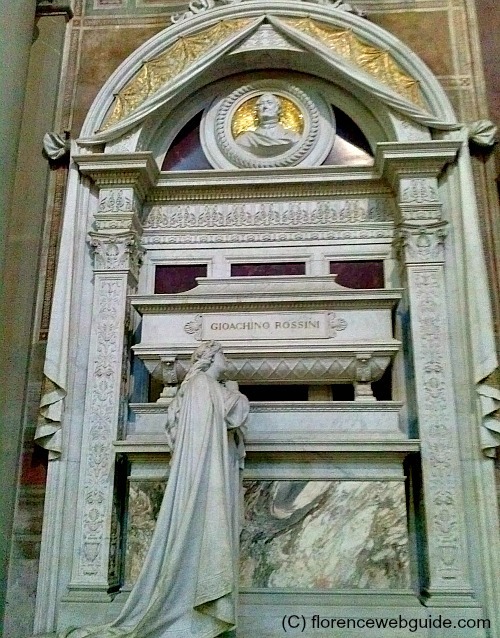 This basilica is the final resting place of many renowned Italians such as Michelangelo, Machiavelli and composer Gioacchino Rossini just to name a few. But what kind of church is Santa Croce? It is the largest Franciscan church in the world and is home to some of the city's loveliest artistic gems. The basilica is home to a series of 13th century frescoes by Giotto that have been admired and studied by artists and scholars for centuries. There are sculpture works by Donatello, an architectural masterpiece by Brunelleschi (the Pazzi chapel), and Cimabue's crucifix from the 1200's. You will also find the oldest example of Florentine stained glass in the church windows, and the finest example of a renaissance pulpit, by Benedetto di Maiano. 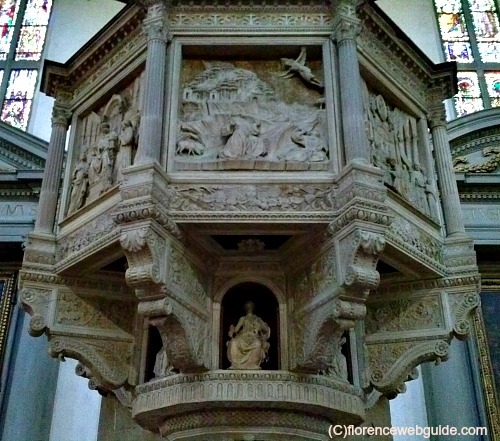 Read on to learn about these and other treasures in Santa Croce in Florence Italy! 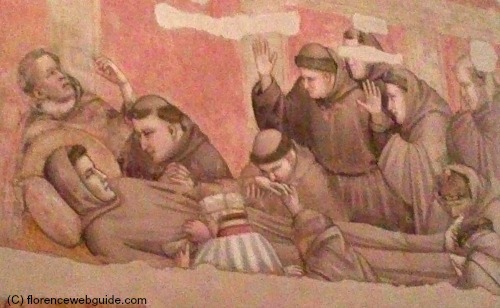 In about 1200 Franciscan monks set up a small place of worship just outside the city walls. This small Franciscan community grew in popularity and, on Santa Croce day (May 3) in 1294 construction was started on a new church. Designed by the renowned architect Arnolfo di Cambio (d. 1302), the same architect who designed the Duomo, the church was built in a Gothic spired style. 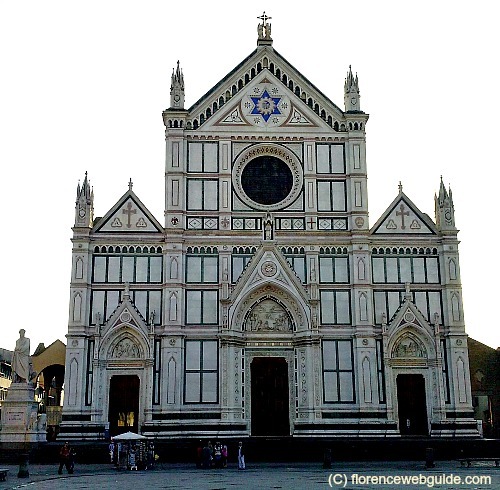 Santa Croce in Florence was consecrated in 1433 on the feast of the epiphany. Not just a place of worship however, in the 14th and 15th centuries Santa Croce was also considered a center of cultural learning. Both Giovanni di Medici (later Pope Leo x) and Dante spent their early learning years here availing themselves of the vast church library and the presence of respected theologians and philosophers. Francsican monks still occupy a large part of Santa Croce in Florence, but the basilica today is more known for being the final resting place of many extraordinary Italians. Here you can visit the tombs of Michelangelo Buonarroti, Galileo Galilei, Niccolò Machiavelli, Lorenzo Ghiberti, Gioacchino Rossini, and other noteworthy names (see more below). The huge church square (piazza Santa Croce) in front of the basilica, which used to be surrounded by houses of the poor and used for large religious ceremonies, today is one of the city hot spots. Impressive palaces now stand around the piazza and the large square is used as an open air market (in December for a Christmas market), for evening concerts and performances, and the annual historic football matches (calcio storico or calcio in costume) each June. 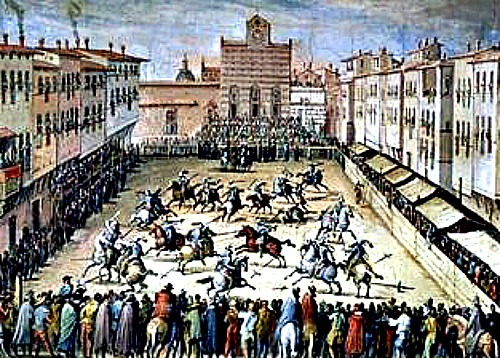 The painting below shows what the piazza looked like in renaissance times when it was used for jousting competitions. 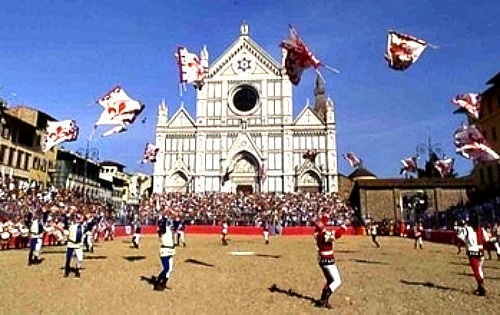 And today, as it is used for the opening ceremonies to the Calcio Storico (medieval football) in the square of Santa Croce in Florence. Several very famous burials have been carried out in the basilica. 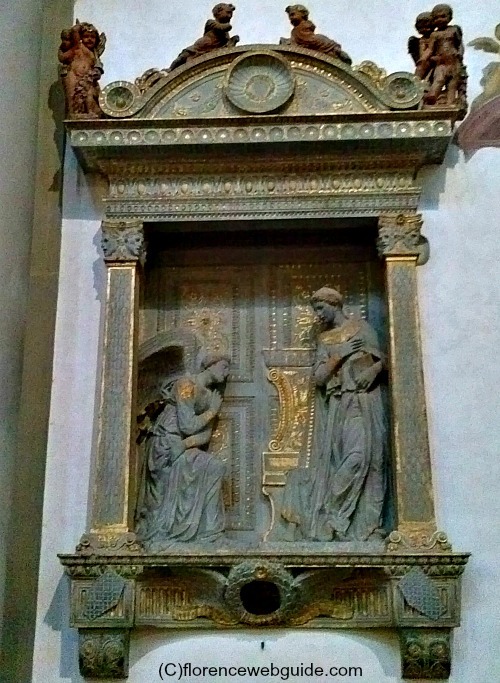 Below see pictures of the 'Gallery of Funeral Monuments' in Santa Croce. 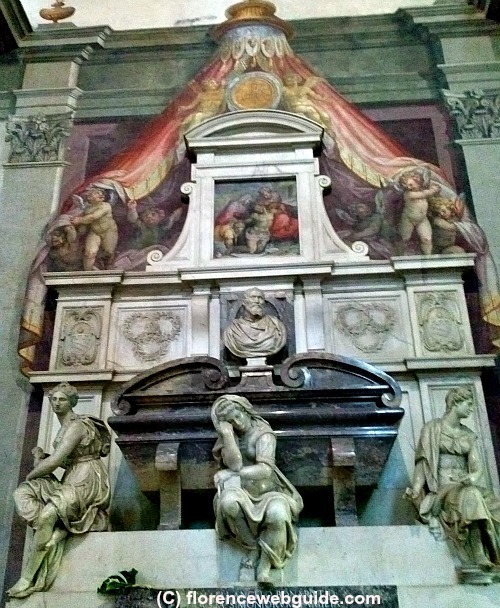 The most lavish tomb belongs to Michelangelo Buonarroti and was designed by Giorgio vasari although several artists actually carried out the works. Michelangelo died in Rome in 1564. The Pope requested that he be buried in St. Peter's, but his remains were sneaked back to Florence where the artist had wanted to be buried. 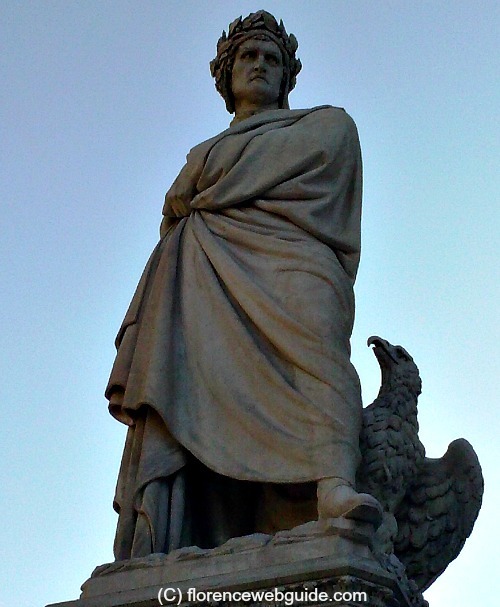 Dante Alighieri, Italy's most illustrious poet, died in exile in Ravenna in 1321 and was buried in that coastal town along the Adriatic sea. 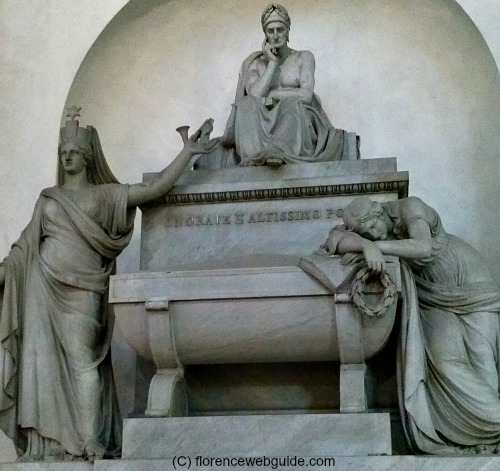 A striking memorial was built however to one of Florence's most influential minds. Called a 'cenotaph', this is a tomb for Dante without the remains of the deceased. 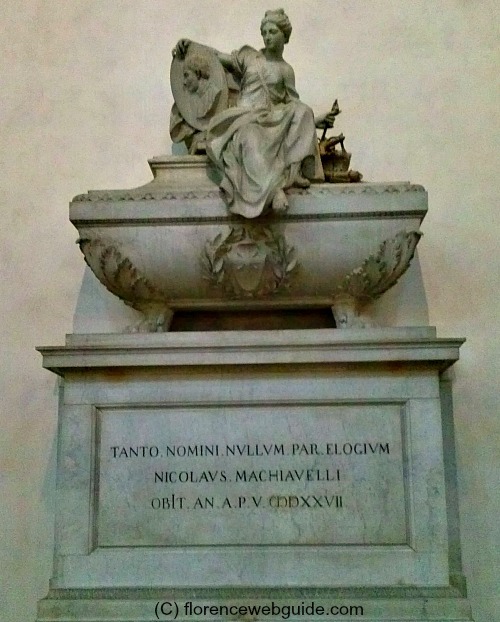 Below see the tomb of Niccolò Machiavelli who died in 1527. The Florentine politician is most famous for his philosophy 'the end justifies the means' leading to behavior described as Machiavellian. Who is this man below gazing up at the stars? Galileo Galilei, called the 'father of modern science', died in Florence in 1642 and is buried in Santa Croce. 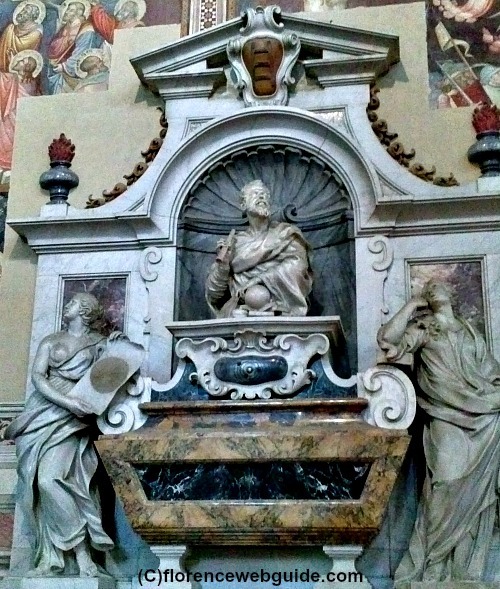 The Baroque style tomb shows a bust of Galileo flanked by figures representing Geometry and Astronomy. A touching story, Galileo's disciple, mathematician Vincenzo Viviani, so loved and admired his teacher that he requested to be buried with Galileo upon his death. When Viviani died in 1703 he too was buried in Galileo's tomb therefore uniting maestro and pupil. Gioacchino Rossini, composer whose most famous work is the opera 'the Barber of Seville' is buried in Santa Croce in Florence. Rossini was not from the Florence area but from the city of Pesaro. When he died in Paris in 1868 he was initially buried there, but his remains were then moved back to Italy. By then, Santa Croce had become a 'temple' to great Italians and therefore the composer dubbed 'the Italian Mozart' was laid to rest in this church. 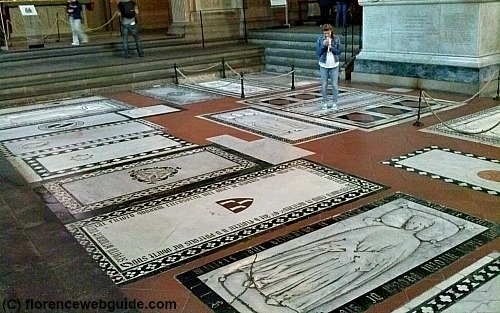 In addition to the more significant memorial tombs, there are a large number of floor tombs in Santa Croce. Among these is Lorenzo Ghiberti, the renaissance master and creator of the 'Doors of Paradise', the bronze doors of the Florence Baptistery. 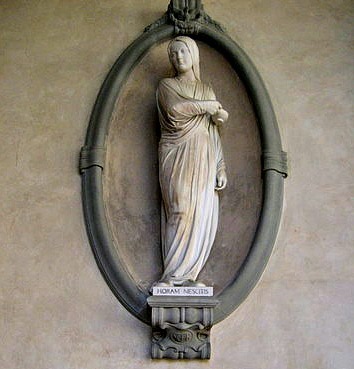 Not a tomb, but a memorial to Florence Nightingale - the mother of nursing - can be seen in the cloister of Santa Croce in Florence. What's the connection between an English nurse and the hub of the renaissance? Florence's parents were having an extended vacation in Italy when she was born in 1820. They decided to name their new born daughter after the city which so impressed them, Florence! This statue to the founder of modern nursing was commissioned by the British community in 1913 and was created by Francis William Sargent. The church of Santa Croce in Florence is a cornucopia of art work by significant masters from the 1300's to the 1500's and beyond. Giotto, Gaddi, Donatello, and Brunelleschi are the more illustrious names....below is a look at some of the more famous works. This gray stone and gold gilded tabernacle contains a bas relief created by Donatello in about 1433. Donatello was commissioned by a wealthy Florentine family to execute this bas relief of the Annunciation to be placed in the family chapel. Donatello worked on this relief upon return from Rome where he studied the ancient ruins and antique art forms, an influence that can clearly be seen in this piece. This pulpit, created by Benedetto da Maiano, is sculpted in white marble and is considered the most accomplished and beautiful pulpit to have been executed during the renaissance. The work is exceptional due to Da Maiano's ability as a master chiseler managing to obtain such authentic renderings of trees, animals, and expressive faces in the stone. The five panels illustrate episodes in the life of Saint Francis. 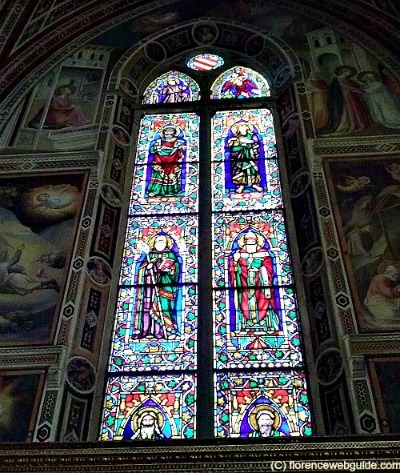 The stained glass windows in Santa Croce are all original going back to the 1300 or 1400's. The window below, from the 1300's, was designed and created by Taddeo Gaddi for the Baroncelli chapel. 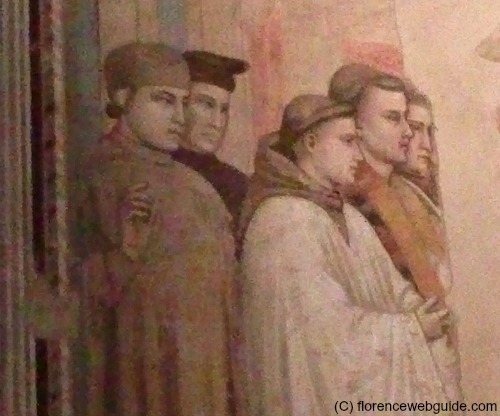 Gaddi was a student under Giotto and was considered his most talented pupil. 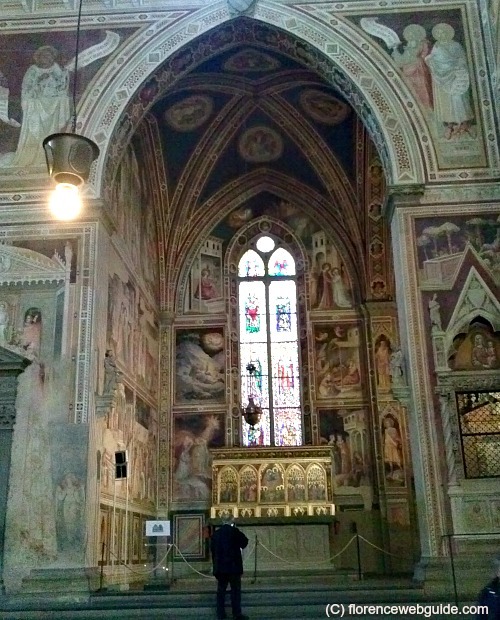 The Bardi chapel (as well as its neighbor, the Perruzzi chapel) are covered by frescoes painted by Giotto. These works depict scenes from the life of Saint Francis. This is probably the most famous chapel in Santa Croce church as the Giotto frescoes decorating the chapel are from a later period in the artist's life when his craft was to have reached its pinnacle. The simplicity, serenity and poetic expression characteristic of Giotto can be clearly seen in the close up detail below from the Bardi chapel. The main chapel of Santa Croce in Florence has the largest cycle of frescoes painted by Agnolo Gaddi (son of Taddeo Gaddi) illustrating the Legend of the True Cross (circa 1380). Renovated over many months in 2014 these images have been returned to their original splendor. The images recount the story of the wood taken from Eden which eventually becomes the cross used to crucify Jesus. This statue dedicated to Italian playwright Giovan Battista Niccolini bears a striking resemblance to the Statue of Liberty in New York. 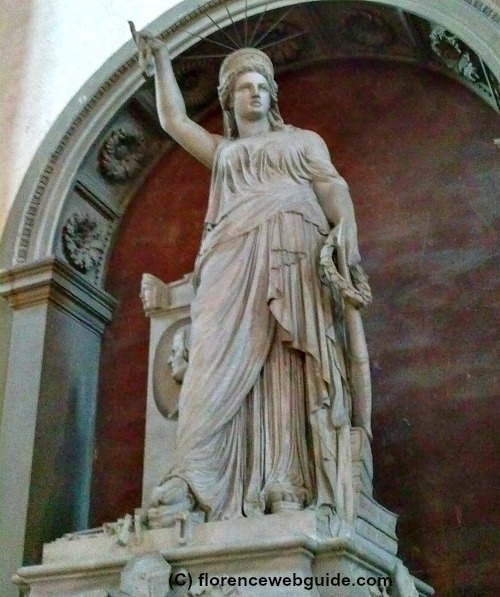 The Florentine statue represents the liberty of poetry and art as represented by the lyre in the left hand of lady liberty and the broken chain held high in her right hand. 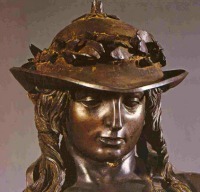 Although no factual proof has been found connecting the two statues, the similarity between Fedi's work and America's statue is undeniable and it is widely believed that the former was likely (in part) the inspiration for the latter. 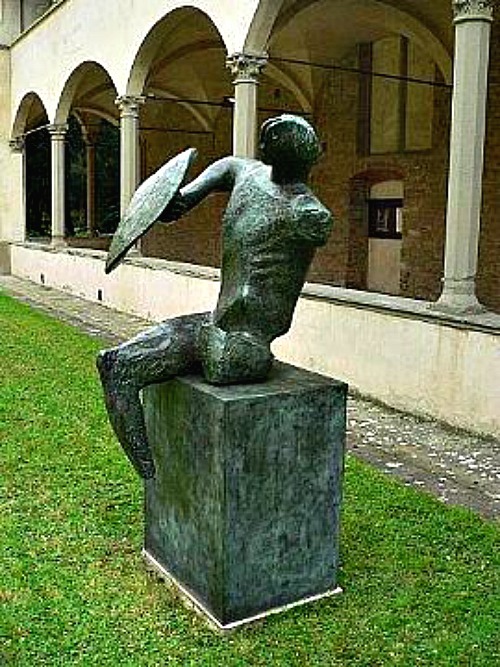 Henry Moore's widow, Irene Moore, donated this bronze sculpture entitled 'Warrior with Shield' (c. 1953) to the British Institute in the 1980's. 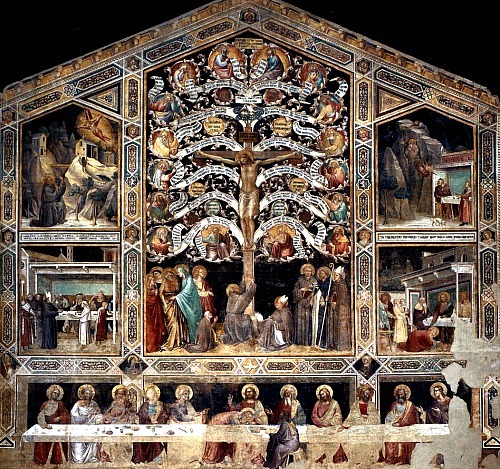 It has been placed in the first cloister of Santa Croce in Florence so that it may be admired by many more people than would have been able to view it at the British Institute. Santa Croce is a church in the Gothic style. Like many churches in Italy, it was without a facade for several centuries since money often ran out before this 'finishing touch' could be added! Indeed, the facade of Santa Croce was eventually paid for by an Englishman named Francis Sloane. When the facade was finally added, of course it had to match the rest of the basilica in style, so a neo-gothic facade was designed in the 19th century. Inaugurated in 1863, the architect of the design was Nicola Matas (1799-1872) who, incidentally, is buried under the steps leading up to the entrance. 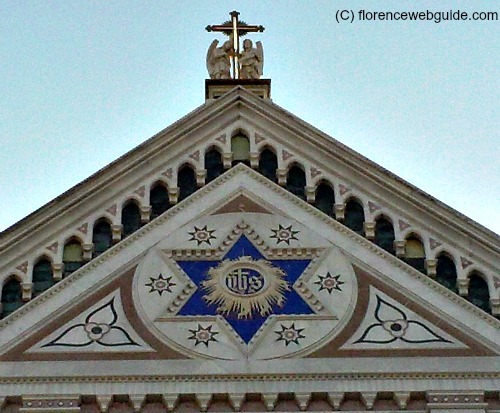 Note the star of David at the top of the facade added by Matas - who was Jewish - and wanted to pay homage to his faith in Santa Croce Florence. 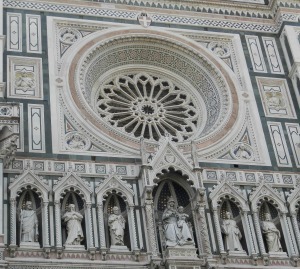 As you can see from the image below, the side of Santa Croce has not been covered in marble like the facade. 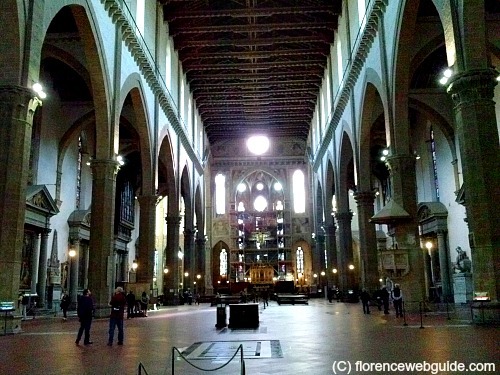 Santa Croce has a T-Cross floor plan, like many churches in Florence. What's unique to this basilica is its many private chapels, a total of 16, along 2 sides of the church. Chapels were private places of worship sponsored by wealthy families so that they could have their own part of the church for individual prayer and services (and to decorated by the artist of their choice!). The image below shows one of the private chapels located in a side niche of the church. 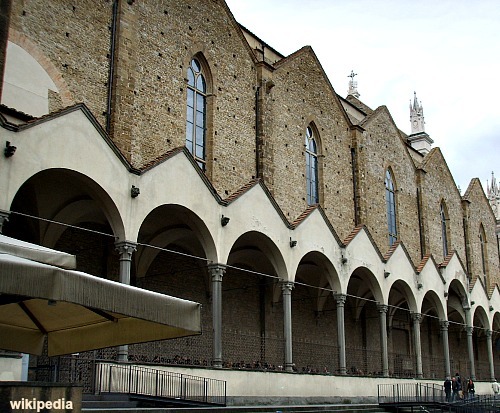 The architecture of Santa Croce includes two cloisters. The first, as you leave the side door of the church, is flanked by a 14th century portico on the left. Standing in the cloister it is so quiet and peaceful, you can hardly believe that just beyond the wall are the busy squares and noisy streets of the city. 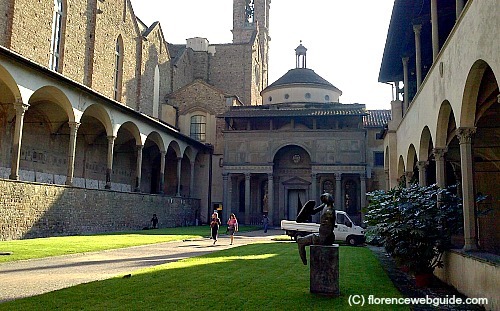 The second cloister of Santa Croce was designed by Brunelleschi but executed after his death by his followers. Dating to about 1450, the Brunelleschian influence is immediately clear in its harmonious archways and elegant simplicity. 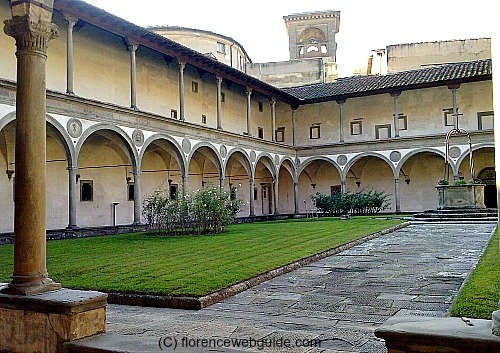 With its symmetrical portico below and open loggia at the second level, this courtyard used to be surrounded by the friars dormitories and provided a peaceful quiet area suitable to the meditative life. 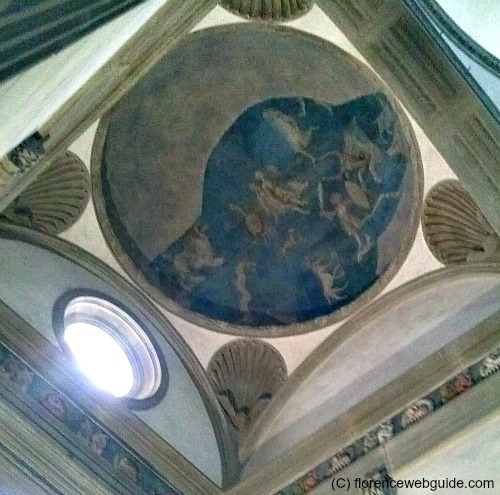 The Pazzi Chapel is one of Florence's most prestigious gems and a masterpiece of renaissance architecture. 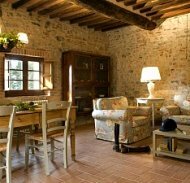 The building was designed and built in part by the master architect Filippo Brunelleschi (c. 1430) on request of the Pazzi family. What is so unique about this work is that the chapel had to be designed and built within the confines of the already standing surrounding constructions (ie the church and convent). It is a testimony to Brunelleschi's genius that the finished product could result is a building of such uniform elegance and symmetry. After Brunelleschi died (1446) the work was continued by others, then left partially incomplete when the Pazzi family were banished from the city in 1478. 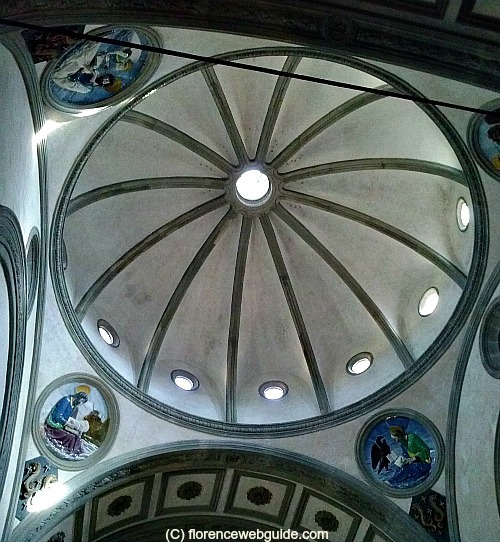 The most striking feature of the chapel is its vaulted dome with oculi (round windows). The cupola seems to rise, in an umbrella-like fashion, and is topped by a lantern. 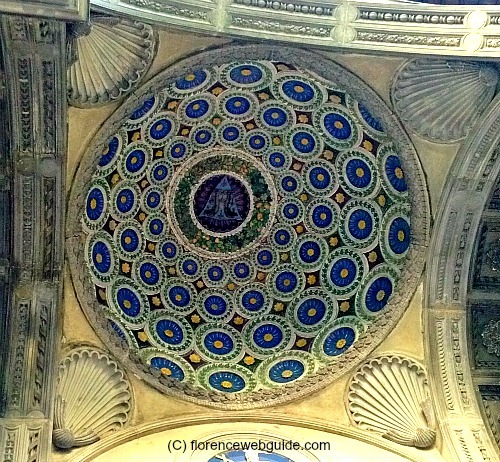 The chapel also has a smaller second dome at the front lined with terra cotta decorations carried out by Luca della Robbia. 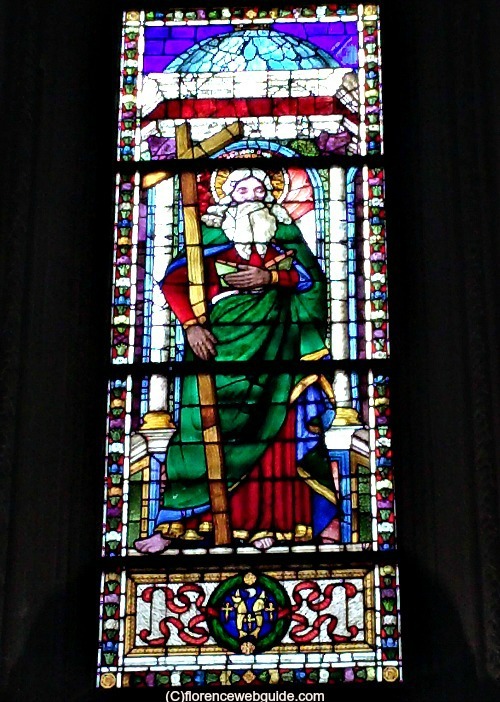 The stained glass window of the Pazzi chapel is an image of Saint Andrea, chosen by Andrea Pazzi. Pazzi chose St. Andrew in order to have the image of a saint with his own namesake. The chapel also has another small dome with astrological decorations depicting zodiac symbols. 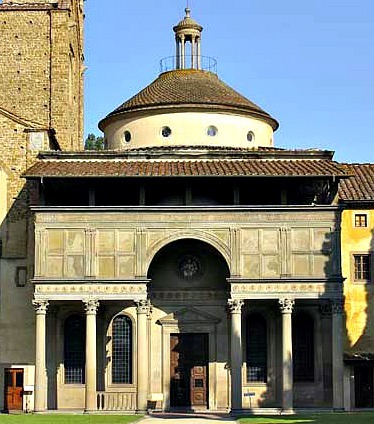 The church of Santa Croce has a small museum which, nevertheless, manages to contain two masterpieces by Cimabue and Donatello among other noteworthy works. 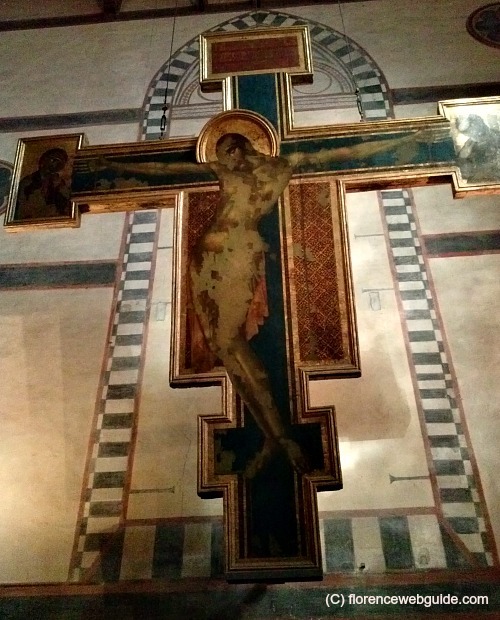 The crucifix by Cimabue is famous (also) for being the one piece of artwork that suffered the most damage in the Florence flood of 1966. Living and working in Firenze in the 1200's, Cimabue was Giotto's precursor and one of the initiators of new expressiveness and naturalism in painting. 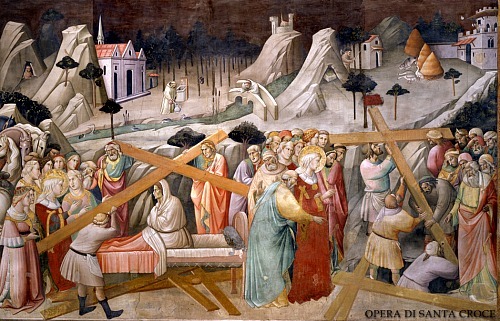 Although irreparably damaged by the flood, the cross is still considered one of Cimabue's master works. 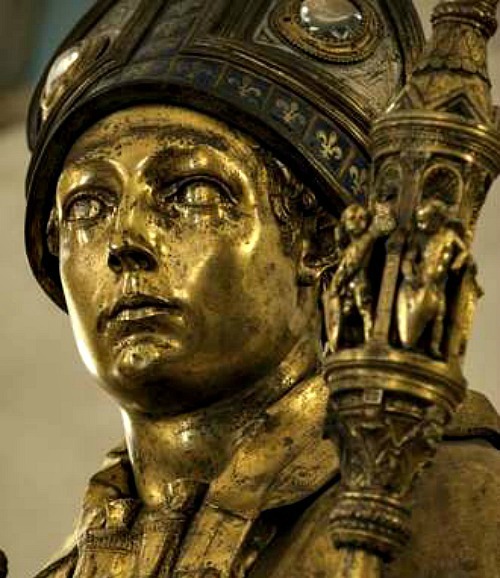 Located in a niche you can see the bronze and gilded statue of Saint Louis of Toulouse by Donatello (c. 1424). Originally created for the church of Orsanmichele, the statue also lived for many years on the facade of Santa Croce. When the neo-Gothic facade was finally installed in the 1860's, the statue was moved inside. This Donatello has recently been restored and spent some time at Paris' Louvre Museum on exhibit but we are lucky to have it back home in Florence! The back of the large refectory has a very large and impressive wall fresco painted by Taddeo Gaddi which also suffered much damage from the Florence flood. Successfully restored today, the fresco depicts several biblical stories including the Tree of the Cross and the Last Supper. This fresco in Santa Croce in Florence is considered Taddeo Gaddi's most accomplished work of painting. The Santa Croce district is one of the busier downtown areas. The square is well known for its leather shops and stalls where you can find good bargains on leather goods. Here's a link if you're interested in finding out about the Florence leather goods scene. 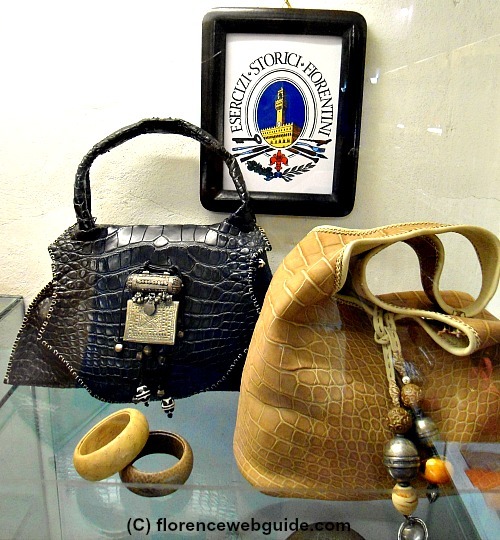 This neighborhood also is home to a real gem of a place: the Santa Croce Leather School. 'La Scuola di Cuoio', as its called in Italian, is a renaissance workshop where animal skins are still worked by hand and made into finely crafted leather goods. You can see it all being done from start to finish at the workshop, and then purchase some of the gorgeous items. The Leather School is located in the Franciscan friars' convent area of the Santa Croce church complex. 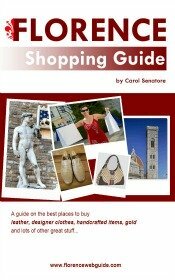 Read all about the Santa Croce Leather School, a unique must-see in Firenze! 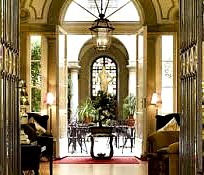 Any accommodation near Santa Croce in Florence will be central and convenient for seeing all the city sights. This area is close to the Arno river, so it's just a hop, skip and a jump to get across the bridge to the south side of Firenze, it's close to the Duomo, and about 20 minutes walking to the station. The area is surrounded by shops and great restaurants too!